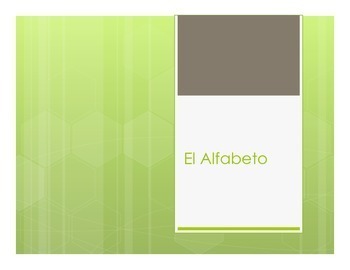 These notes review the Spanish alphabet. They include an alphabet list, pronunciation guide, cultural tidbits about losing letters from the alphabet, and notes on the variations in pronunciation of B/V and LL. 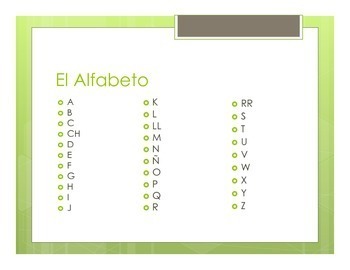 This activity reviews the Spanish alphabet. Please note - in my alphabet products, I still include the letters LL, CH, and RR to make sure that students recognize references to those letters, even as they are phased out. 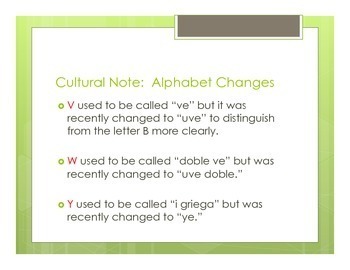 My Spanish Alphabet Notes go into more detail about letters being dropped and changing their names (Y, W), and we openly talk about the changing nature of the alphabet... and the human tendency to refer to the alphabet the way we first learned it as children even if we know there has been an official change. 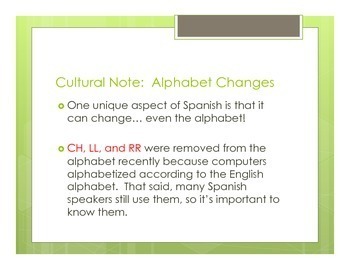 These notes primarily focus on the ACTFL language and cultural comparison standards.